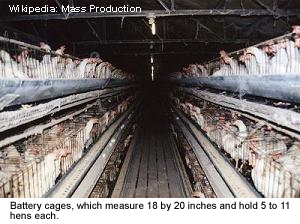 Battery cages, which measure 18 by 20 inches and hold 5 to 11 hens each. Many animal rights advocates object to killing chickens for food or to the "factory farm conditions" under which they are raised. They contend that commercial chicken production often involves raising the birds in large, crowded rearing sheds that prevent the chickens from engaging in many of their natural behaviors. Contrary to popular belief, however, meat-type chickens are not raised in cages and are instead raised on the floor on litter such as rice hulls. They are slaughtered prior to sexual maturity, and thus many of the aggressive behaviors seen in adult chickens (fighting, cannibalism) are seldom seen in meat-type chickens. In 2004, 8.9 billion chickens were slaughtered in the United States. Another animal welfare issue is the use of selective breeding to create heavy, large-breasted birds, which can lead to crippling leg disorders and heart failure for some of the birds. 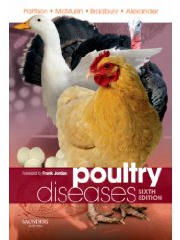 In addition, many scientists have raised concerns that companies growing one variety of bird for eggs or meat are causing them to become much more susceptible to disease. For this reason, many scientists are promoting the conservation of heritage breeds to retain genetic diversity in the species.